(Dunedin, Florida) - I have been very fortunate to work for an organization like the Vancouver Canadians that sees value in sending its broadcaster South for Spring Training. From three years watching the Oakland A's down in Scottsdale/Phoenix to the past nine years making my way over to Dunedin for Blue Jays workouts - there has always been plenty to discover and learn over my compacted but useful time with the boys. This spring has a different feel from past years at the Bobby Mattick Complex - perhaps its the major renovations or the new sound of Spring. 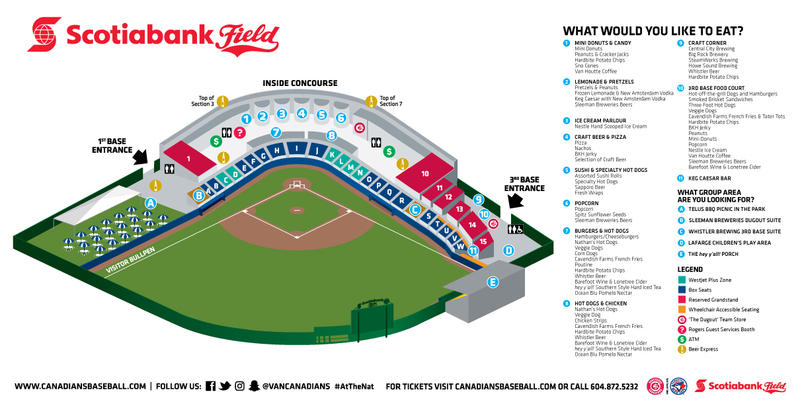 Here are a number of tidbits that come with a Vancouver Canadians spin. 1) Head and Shoulders - Canadians RHP Nate Pearson (2017) is healthy and back throwing hard once again after breaking his arm early last season when he was hit by a line-drive. He was starting to throw well during the Fall League, but with a few months of rest and an vigourous off-season workout schedule Nate looks every bit the part of the 6-6 giant that dominated the Northwest League and helped the Canadians to the 2017 Championship. Expect Nate to play between Dunedin and potentially New Hampshire if everything stays status quo. 2) Double Take - When former Vancouver 1B Kacy Clemens (2017) got through the entire NWL regular season without an error, he would be the first to admit the ol' body might have been a little soft. Clemens dropped 17 pounds this off-season and looks stunningly different by comparison to his frame from two seasons ago. Its one part maturing into his early-20's body, but its also day after day of grinding it out behind the scenes. There is no one that looks more improved than Kacy from the end of last season to the start of this one. 3) Camp Casual - Since I first started attending Blue Jays Minor League Camp I have always been able to easily identify players by the name and number on the back of their jerseys. 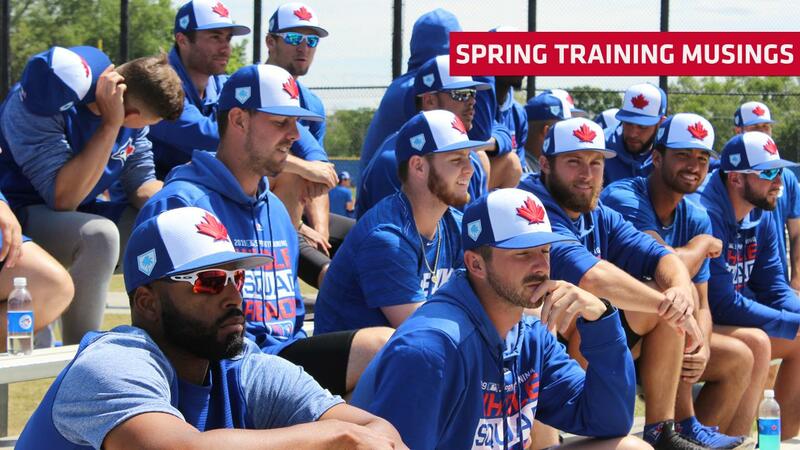 Those days are over as the executive has allowed players to trade in their heavy polyester jerseys for dri-fit T-shirts that simply say 'Blue Jays Spring Training' on the front with no identifyable digits on the back. Its a stark contrast to the buttoned-up mentality from days gone by and players are likely thrilled as the heat beats down on them during workouts. 4) More Musings - In addition to the jersey swap-out, music now pounds across the complex as the atmosphere pre-scrimmage seems downright likeable as players can be seen more relaxed and focused while the beats help them along. It could also be because it helps drown out the racket that comes from the heavy duty renovation that has already begun on-location. The multi-million dollar facelift has so much going on that Spring Training is down a full field of play already (from five down to four) and crews can be seen taking thier collective breaks during scrimmages to ensure the drills and hammers don't drown out the sounds of the game itself. 5) 'Stro Sightings - Former Vancouver RHP Marcus Stroman (2012) pitched on the Minor League fields this past Monday and did so in front of almost every pitcher in attendance at MiLB camp. There is no doubt that when the Major League staff ace comes to the park - everyone wants to watch his every move. Stroman seems to be in a different world and its intoxicating to watch as he goes through his stretching, warm-up alongside personal catcher Danny Jansen and then the handful of innings that come with getting his work in. Stroman tries everything during his outing from changing his cadence to working from different arm slots and pitch grips. Sometimes you forget how unique a pitcher Stroman is and how he is evolving every time out. Focus on his social media and vibrant persona and you might miss the reality that he is constantly working on his craft and recipes which are enchanting to watch even during a Spring game at the MiLB complex. Editors Note: Even after gushing about Stroman's work, I will add that Toronto needs a personality like his within the organization. The Duke University graduate is incredibly aware of his presence on social media and within the clubhouse even taking former Blue Jays slugger Jose Bautista's spot in the locker room (back corner). He is confident, sure-minded and works to outwork others. He wants to face the Yankees, Red Sox and Astros and asks for the ball when the chips are on the table. Yes, he's an acquired taste, but winners want what others fear - and this young core heading upward throughout the system could use a dose of Stroman's aura whether he's engaging or not. 6) The Right Stuff - There has always been a black cloud surrounding Minor League Baseball players and what they make for a wage during their time within an organization. Minor League organizations like the Canadians have always tried to provide players and staff with as much assistance as possible from housing families right through to additional clubhouse attendants who try and make the players keep their money in their pockets. That said, the Blue Jays are rumoured to be close to giving every single Minor League player within the organization a 50% raise from what they were previously earning. Its a significant move from Toronto as they broke from the standard and now 29 other organizations are figuring out how to respond in-kind. Don't think the news was well received? A pair of Latin-born players upon hearing the news almost started tearing up as they realized they would be able to perhaps send some addtional money home to families that look to them for help. When it happens the Blue Jays should be applauded for this industry push - and hopefully all teams follow along. Note: The Blue Jays are also the only affiliate within the NWL to provide two (2) buses for their players to travel on giving their prospects more space and comfort during those lengthy bus rides throughout the Pacific Northwest. 7) New Crew Review - Canadians President Andy Dunn and General Manager Allan Bailey had the opportunity to meet this coming season's coaching staff led by manager Casey Candaele. The former Major Leaguer who was recently a first base coach with the Seattle Mariners will be assisted by first-year pitching coach Demetre Kokosis, second-year hitting coach Aaron Mathews and bench coach Danny Cannellas. The move comes just months after former Canadians manager Dallas McPherson (2018) was promoted to Lansing and longtime C's pitching coach Jim Czajkowski (2011-2014, 2017-18) heads to Dunedin of the Florida State League. Candaele is quiet but incredibly witty keeping things lose for prospects that are likely feeling a touch nervous having just turned professional. Kokoris is high-energy and innovative looking for more and more information to share with his staff and Aaron Mathews is back having worked as high up as Buffalo (Triple-A) just two seasons ago. Cannellas had heard about Vancouver from last year's bench coach Jose Mayorga and says he felt like he "won the lottery" by getting the chance to come to Vancouver this coming season. 8) Borucki Bobble? - As the Canadians begin to put the final touches on this year's promotional schedule (coming out soon), rumour has it that they were looking for a former C's player to immortalize and one that hasn't been as of yet. With a few players recently making the jump to the Big Leagues, rumblings are that former Canadians arm LHP Ryan Borucki (2014, 2016) might get the call to the Bobble Head Ledge of Fame. Not confirmed, but if this does happen he will join RHP Marcus Stroman, RHP Roberto Osuna, RHP Aaron Sanchez, RHP Noah Syndergaard and OF Kevin Pillar as bobbleheads created by the Canadians. If you really want to split hairs, he also joins Bob Brown Bear, Chef Wasabi, a dancing groundskeeper and the Bob Frietas Championship Trophy as items presented to fans in the mold of some of our greatest personalities/achievements. 9) Tech Talk - You cannot go ten feet within the Minor League Complex without noticing some form of tech advancement that is helping provide data, data and more data for coaching staffs and the players themselves to help improve their understanding about performance enhancement. It's staggering what a simple batting practice looks like with the Blue Jays utilizing items such as Rapsodo which shows everything from spin rates to exit velocity and a hundred other pieces of information. Is it too much? Depends on what your using it for - as players still need to adjust physically after seeing the needed data. It's one thing to see your weakness, its another thing to be able to get your body to make the adjustment. From a coaching perspective the tech is a goldmine of information that could help find an advantage or a weakness ahead of the game itself. Its outstanding to see in real time and only time will tell of its overall benefit - but boy, is it easy to spot while taking in any form of workout.